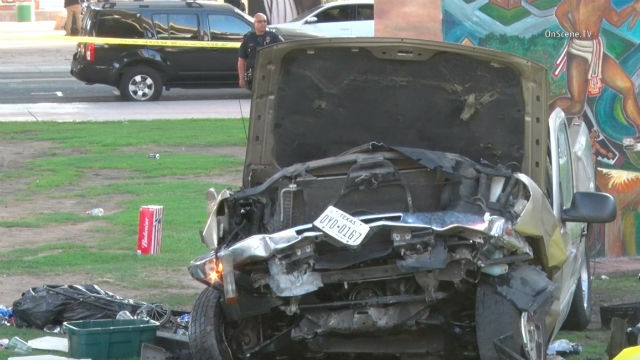 A Navy aviation electrician who was allegedly under the influence of alcohol and speeding when his pickup truck careened off a transition ramp to the Coronado Bridge and onto a kiosk below in Chicano Park, killing four people, was ordered Monday to stand trial on gross vehicular manslaughter and DUI charges. Richard Sepolio, 25, is accused in the Oct. 15 deaths of Annamarie Contreras, 50, and Cruz Contreras, 52, a married couple from Chandler, Arizona, and Hacienda Heights residents Andre Banks, 49, and Francine Jimenez, 46. After a preliminary hearing that began last month, Judge Kathleen Lewis found that enough evidence was presented for Sepolio to stand trial. The judge said Sepolio’s actions constituted gross negligence, and that he was under the influence at the time of the 3:30 p.m. crash. Lewis noted that an officer detected an odor of alcohol coming from Sepolio’s breath and that the defendant admitted that he was feeling the effects of alcohol after the crash. Sepolio, who was based at Naval Air Station North Island in Coronado, faces nearly 24 years in prison if convicted. California Highway Patrol Officer Juan Jimenez, who arrested Sepolio at a hospital, testified last month that he observed that Sepolio had red, watery eyes. Jimenez said Sepolio blew into a preliminary alcohol screening device twice, with readings of .059 percent and .060 percent blood-alcohol content, and later had his blood drawn. An expert testified that the defendant’s blood-alcohol level was between .08 and .09 percent at the time of the crash. Sepolio’s attorney, Paul Pfingst, argued unsuccessfully that his client’s actions constituted ordinary negligence, not gross negligence. Pfingst said there was no evidence that Sepolio was on a cell phone arguing with his girlfriend at the time of the accident, as prosecutors suggested. The attorney said Sepolio lost control of his truck as he tried to pass another vehicle on the transition ramp, hit the left guardrail and careened across the road, over the right guardrail and into the park. Pfingst argued that Sepolio’s blood-alcohol content could have been under .08 percent. Deputy District Attorney Cally Bright told the judge that Sepolio was going 87 mph in a 45 mph zone after drinking at lunch. Carlos Ulloa, who lives nearby, testified last month that he was checking out an event at the park about 3:30 p.m. when he heard screeching tires and saw the defendant’s truck flying over the guardrail. Ruiz told Pfingst that Sepolio didn’t appear to be intoxicated when he left her house. Sepolio will be back in court Sept. 21 for arraignment.